"The dramatic secret history of our undeclared thirty-year conflict with Iran, revealing newsbreaking episodes of covert and deadly operations that brought the two nations to the brink of open war"
A senior historian for the federal government with unparalleled access to senior officials and key documents of several U.S. administrations, Crist has spent more than ten years researching and writing "The Twilight War," and he breaks new ground on virtually every page. Crist describes the series of secret negotiations between Iran and the United States after 9/11, culminating in Iran's proposal for a grand bargain for peace-which the Bush administration turned down. He documents the clandestine counterattack Iran launched after America's 2003 invasion of Iraq, in which thousands of soldiers disguised as reporters, tourists, pilgrims, and aid workers toiled to change the government in Baghdad and undercut American attempts to pacify the Iraqi insurgency. And he reveals in vivid detail for the first time a number of important stories of military and intelligence operations by both sides, both successes and failures, and their typically unexpected consequences. Much has changed in the world since 1979, but Iran and America remain each other's biggest national security nightmares. "The Iran problem" is a razor-sharp briar patch that has claimed its sixth presidential victim in Barack Obama and his administration. 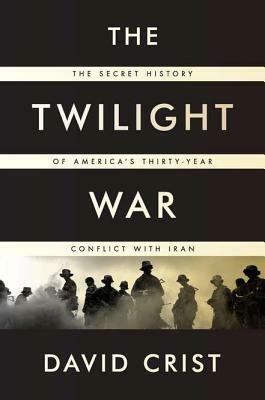 "The Twilight War" adds vital new depth to our understanding of this acute dilemma it is also a thrillingly engrossing read, animated by a healthy irony about human failings in the fog of not-quite war. Dr. David Crist is a senior historian for the federal government and frequent adviser to senior government officials on the Middle East. As an officer in the U.S. Marine Corps Reserve, Crist served two tours with elite special operations forces in Afghanistan and Iraq and was part of the first U.S. military forces inside Afghanistan who overthrew the Taliban. He received a B.A. from the University of Virginia and a master's and doctorate in Middle Eastern history from Florida State University.